SCVHistory.com LW3137 | People | Tiburcio Vasquez Birthplace; Plus: Colton Hall, Old Monterey Jail. 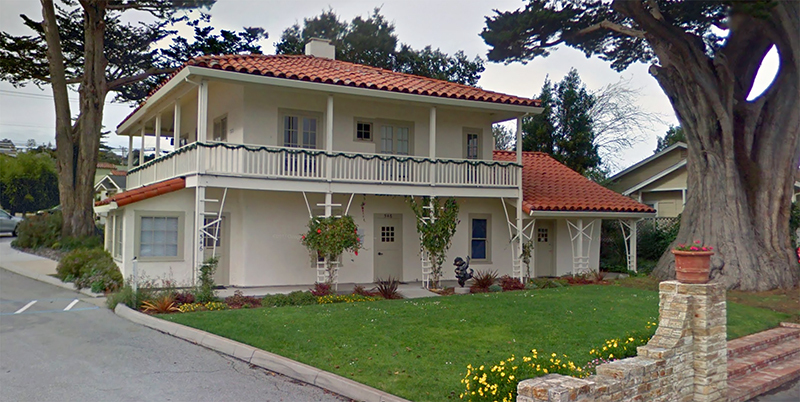 It has been modified significantly over the years, but the birthplace and childhood home of the notorious California outlaw Tiburcio Vasquez still stands in its original location at 546 Dutra Street, Monterey, Calif. Today (2017) it is owned by the City of Monterey, which uses it as the administrative office of its Recreation Department. Old-timers recalled the young Vasquez as a bright and clever boy, a popular poet, musician and dancer who could read, write and speak fluently in English and Spanish. He grew up to be a dandy and a lady's man, and one of the most notorious bandits in California history. ... Legend suggests that the wily Tiburcio often returned to visit his sister in the old family home despite the house being located right behind Colton Hall — then the Monterey County Courthouse — with the County Jail right next door. Colton Hall has an address of 570 Pacific Street, but it is located directly across the street (Dutra Street) from Casa Vasquez. Colton Hall was where the Constitutional Convention met from Sept. 1 to Oct. 15, 1849, and drafted the constitution under which California was admitted to the union a year later, on Sept. 9, 1850. Directly next door to Colton Hall is the old Monterey jailhouse, used from 1854 (when Monterey was the county seat) until 1956. The Vasquez House is California Historic Landmark No. 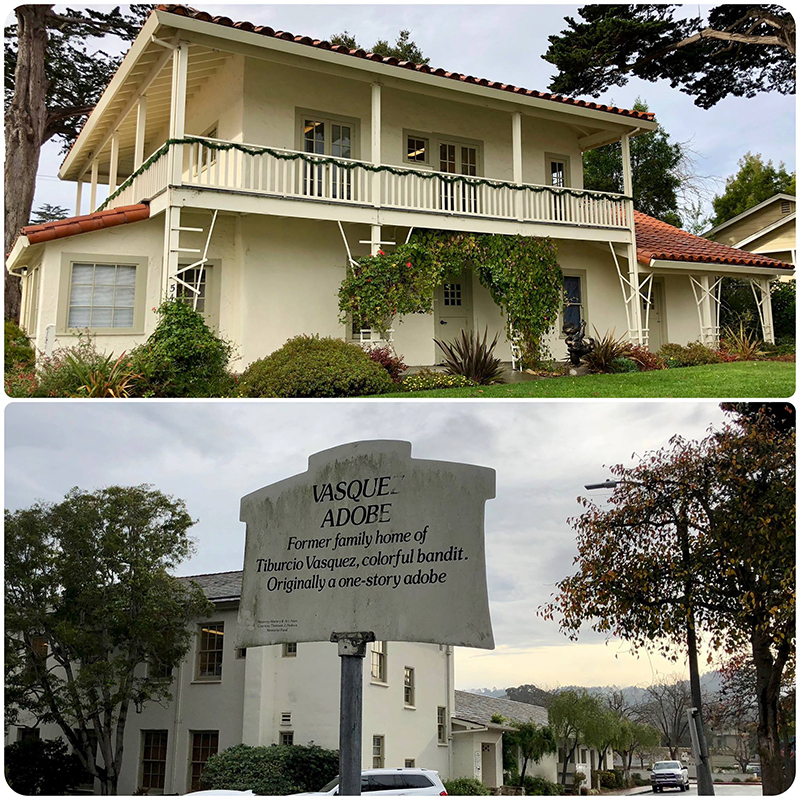 351, which designation gives short shrift to Tiburcio's 22-year criminal career: "This adobe house was occupied by a sister of Tiburcio Vásquez, the colorful Monterey bandit of the 1870s." 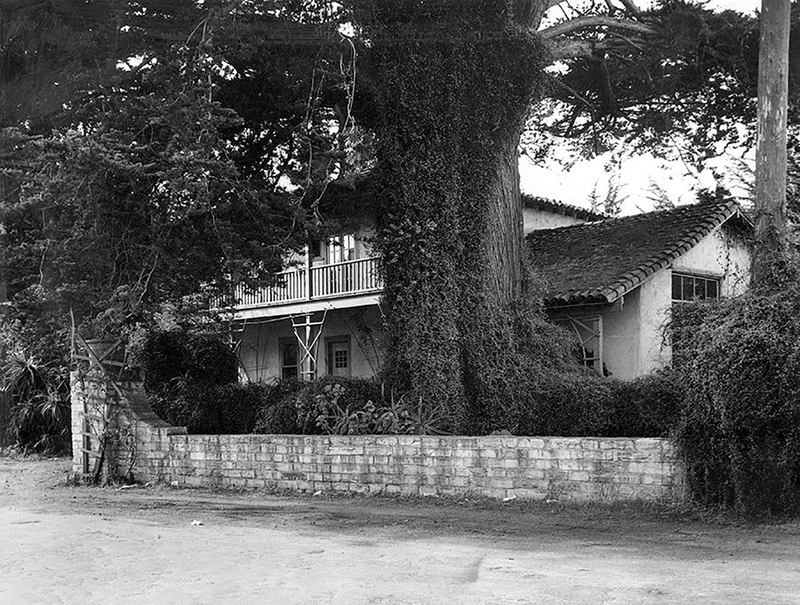 Little remains visible of the original building, due to many extensions and renovations, including the addition [in 1922] of the second floor of stuccoed wood by Louis Hill, one of California's railroad tycoons. Today's irregular floor plan takes in verandas on both the first and second floors, a shed-like addition to the ground floor on the eastern elevation, and a hip roof of shingles. The photographs in the carousel above were made February 18, 2018. 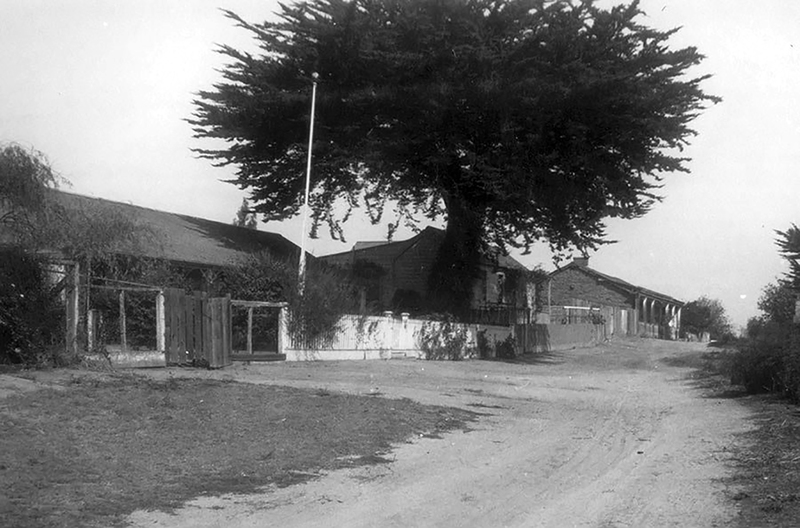 The historic images below are from the City of Monterey. Above: Photos by Ron Kraus, January 2018. Click to enlarge. Above: Casa Vasquez behind Colton Hall, circa 1905. 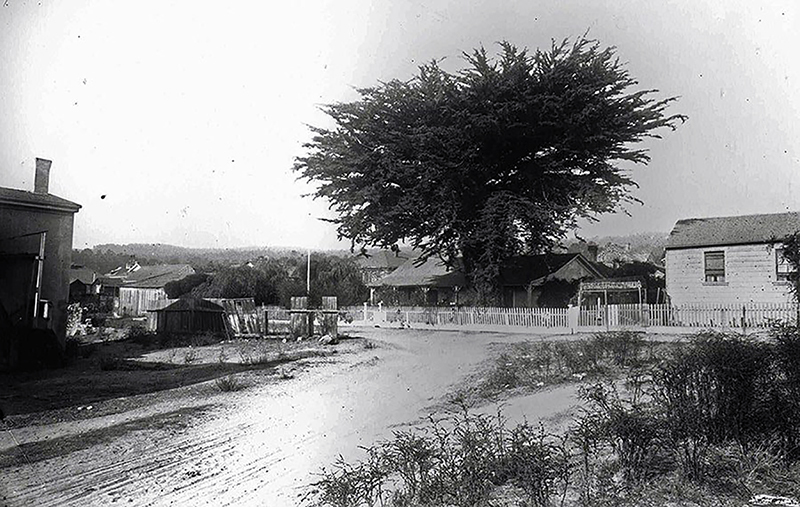 Above: Casa Vasquez on old Dutra Way, 1910. 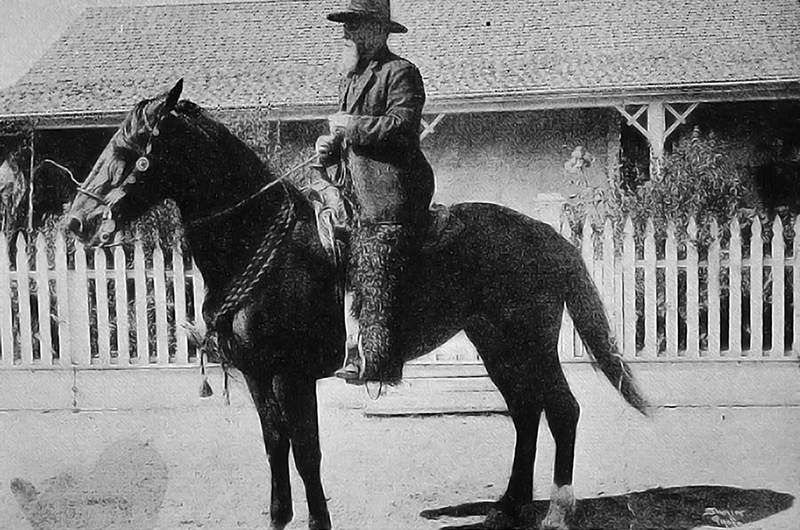 Above: Teodoro de la Torre, a vaquero (cowboy), at Casa Vasquez, 1910. 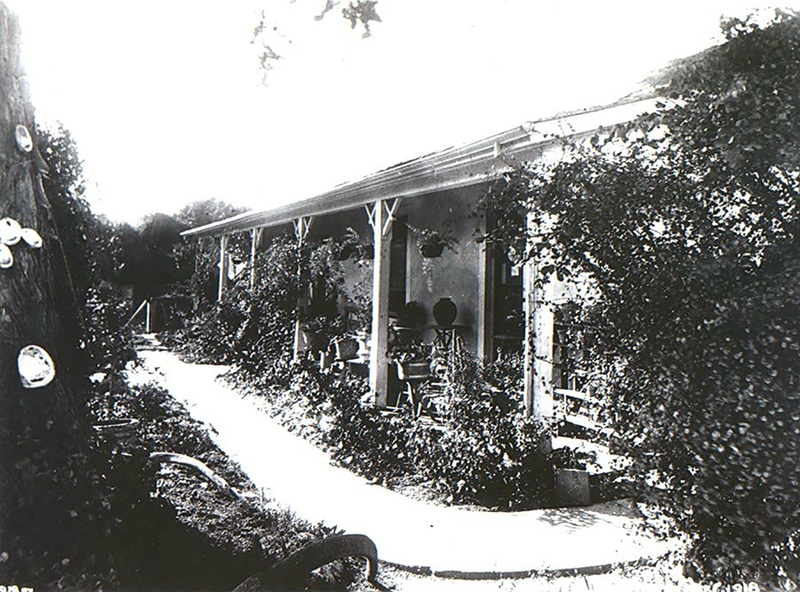 Above: Vasquez House after 1922 additions. Above: 2017 Google Street View. LW3137: 9600 dpi jpegs. Online only.